The source on which our story is somewhat loosely based is a little-known chapbook of 1740 entitled "Round about our Coal Fire; or, Christmas Entertainments". In this little book are recounted a number of tales, including "Enchantment demonstrated in the Story of Jack Spriggins and the Enchanted Bean; giving a particular Account of Jack’s arrival at the Castle of Gogmagog; his rescuing ten Thousand Ladies and Knights from being broiled for the Giant’s Breakfast; jumping through Key-holes; and at last how he destroyed the Giant and became Monarch of the Universe". Although this differs in many respects from the Victorian version familiar to us today, the basic plot is the same. Jack unwittingly plants a bean acquired through some magical agency. The resulting beanstalk grows with alarming rapidity and leads Jack through various adventures to arrive finally at the giant’s castle. Love, fame and fortune follow as he defeats the fearful giant. 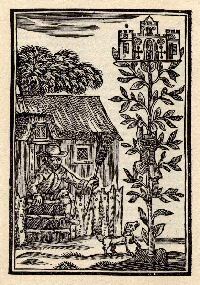 The dedication of the booklet is to “The Worshipful Mr Lun, complete Witchmaker of England and Conjuror-General of the Universe at his Great House in Covent Garden. This refers to the famous impresario, harlequin and theatre manager John Rich, whose stage name was Ned Lun and whose theatre in the 1740s was in Covent Garden. It was Rich who is generally credited with the invention of English Pantomime. Although the term itself was employed earlier by the Dancing Master John Weaver (of the rival Drury Lane theatre) to describe a rather more serious “Entertainment in Music and Dancing in imitation of the pantomimes of the Ancient Greeks and Romans”, it was Rich who recognised the comic (and economic) potential of this new art form. Unlike the Victorian version it was not targeted at children, nor restricted to the Christmas season, but provided a general medium for a variety of entertainments, including the serious dance of the pre-Romantic ballet. In addition, most 18th century pantomimes included English versions of the commedia dell’arte characters -- Harlequin, Pantalone, Columbine, etc. – although these are missing from the present performance and do not appear in the original text. While exploring the more obscure byways of theatre and music in earlier times, Chalemie has adopted this early style of pantomime as a convenient medium for its own unique brand of total theatre. Combining dance with the songs and music of the period, together with authentic instruments and costumes, it seeks to evoke the magic of theatre in this past age. 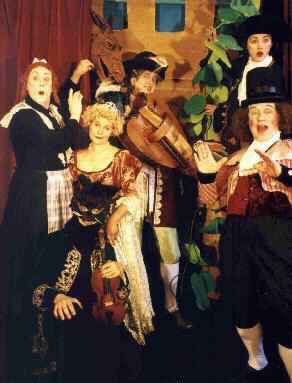 The music in this production is taken from eighteenth century sources, chiefly from the pantomime music of the period; many of the songs are from The Beggar’s Opera (using the same original popular tunes, but with different words, a practice common at that time). Most of the dances are reconstructions of dances choreographed in the early eighteenth century (and recorded in an elaborate and elegant notation system), several being taken from French opera-ballets of this period.